Gnocchi ( the "ch" in italian has the same sound as a K) were traditionally introduced in Europe when potatoes arrived from the Americas. The Romans specifically introduced them into the Italian region, importing them from various areas of their vast empire. Since gnocchi, literally means dumplings, it might have an even older origin than pasta itself. When I think about gnocchi in any shape or form, I just have the image of my mother with her apron full of flour and her 'mattarello" ( rolling pin). It was a tedious and hard process, but the result was always rewarding and tasty. While we may have the desire to make gnocchi from scratch, and it is the preferred method, this recipe calls for the dried, vacuum sealed variety. Because most weeknights, that can make this delicious dish accessible. We will post a gnocchi from scratch recipe in the near future. Gnocchi can be made with the most varied ingredients, such as squash, bread, and semolina flour; and they can be flavored mixing the dough with spinach, saffron, and even truffles. They are boiled in water or broth and like pasta they can be dressed with many sauces such as pesto, tomato, butter and cheese. One of may favorite type of cuisine is the 'rustic' cooking, homemade, old grandma, traditional cooking. Something that has been sent down from generation to generation and that you know it has to be made from fresh simple ingredients. 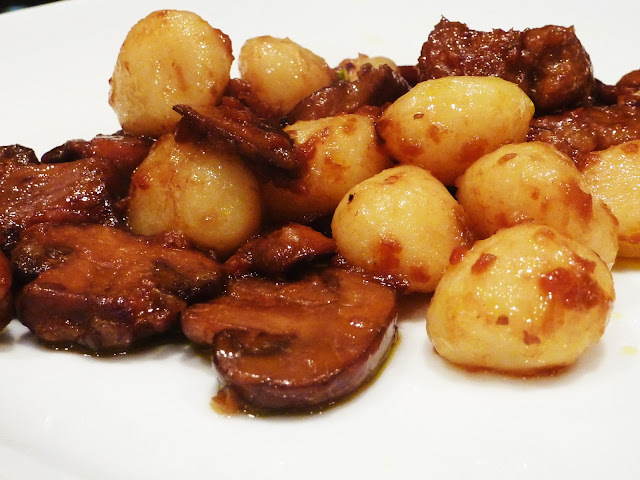 Gnocchi with funghi e salsiccia definitively give me that feeling, home, hearty rustic, tasty style of food. Combine the carrot, celery and leak in a chopper or food processor until finely chopped. Then saute them in a hot skillet with 3 tablespoons of the butter. Once they begin to soften, add all of the mushrooms. Stir all together over high heat. Cook for about 5 minutes, then add the marsala wine. Again, stir occasionally, until the mushroom mixture begins to caramelize, and the most of the wine has been reduced. Season with salt and pepper. Lower the flame to a simmer, and cover for about 15-20 more minutes. If the mixture becomes to appear too dry, you can add some more wine, or more butter. Heat another smaller skillet and add the remaining 2 tablespoons of butter. Next, get the sausage and remove it from the outer casing, crumbling it into small pieces into the hot skillet. At this time add your sprig of fresh rosemary, coarsely chopped. Once the sausage is cooked, add it to the mushroom mixture. Stir all of the ingredients together, and remove from heat. While the sausage and vegetable mixture are cooking, bring a large pot of salted water to a hard boil. When water is ready, drop in the gnocchi and cook to package directions, being very mindful not to overcook. They only take a few minutes. When gnocchi are done, drain them, then toss them with the mushroom sausage mixture over high heat, until everything is uniformly combined, and nice and hot to be served. The gnocchi should be stirred very gently, as they are delicate. If you like, serve in your desired serving dish with a sprinkling of grated parmesan cheese on top. This is a hearty, delicious, rustic meal. ENJOY!